X-Factor battles the Right as the hunt for Archangel. X-Factor manages to locate Archangel, just as they're attacked by a group of cyborg Right soldiers. 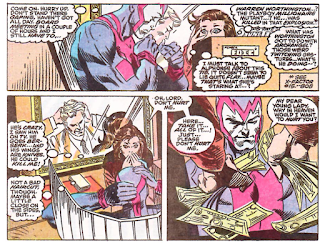 Meanwhile, Crimson plots to use Archangel to destroy the rest of the Ravens, while Archangel, hallucinating that he's an untransformed Warren Worthington, visits a bank, where a frightened teller believes he's there to rob the place, drawing the attention of the cops. 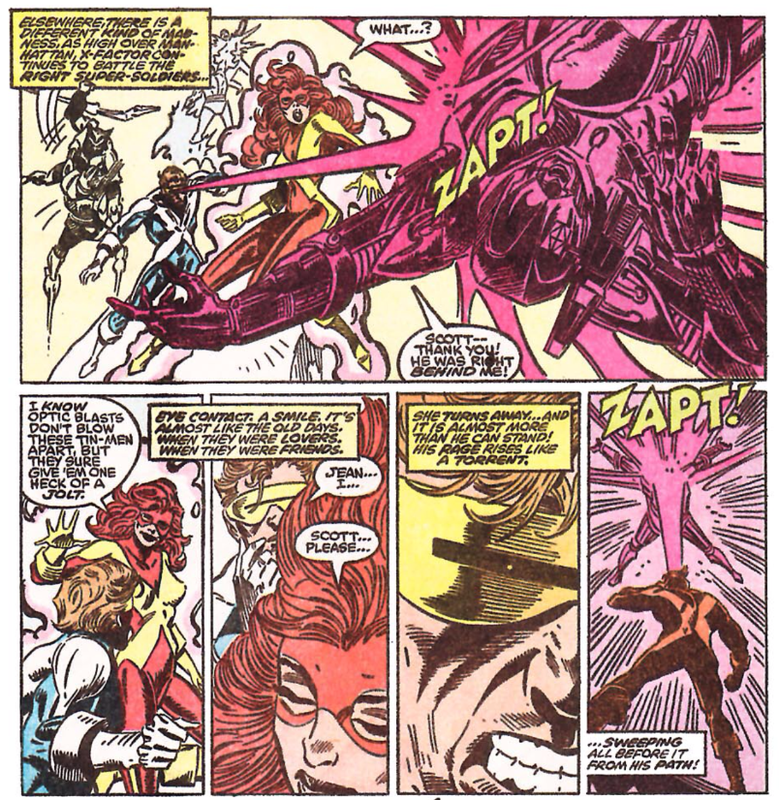 Just then, the Right break off their attack with X-Factor, and when Charlotte Jones breaks the news of Archangel's presumed robbery to them, they realize the Right are going after him. Outside the bank, the Right attacks Archangel, but just as he gains the upper hand, they are teleported away by their shadowy leader, who is pleased to have taken Archangel's measure. X-Factor arrives on the scene after Archangel has fled, and are soon joined by Forge and Banshee. 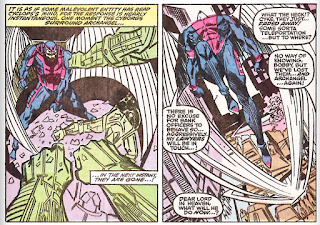 Forge tells them he believes Archangel is being continually poisoned by a capsule inserted into his body, and has created a device to neutralize it. Reasoning where Archangel's next stop will be, X-Factor, Banshee and Forge head to the headquarters of Worthington Industries. 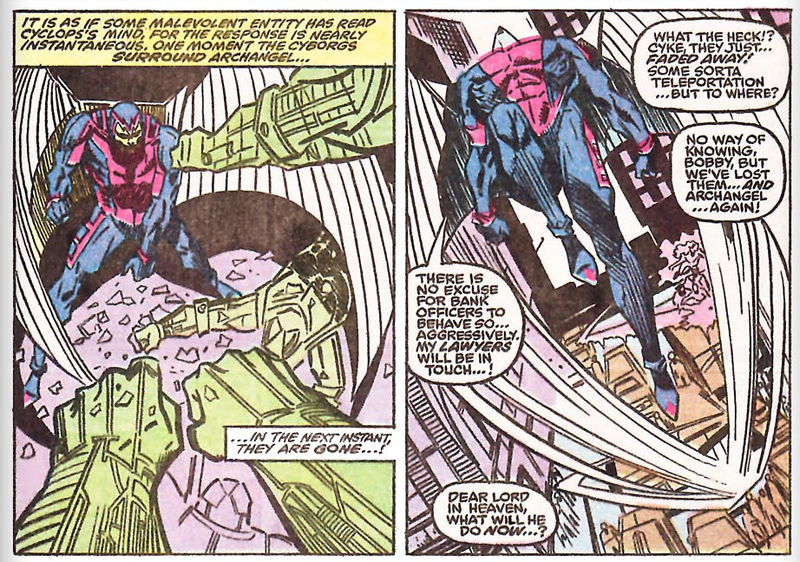 But Archangel spots them and attacks. During the melee, Beast manages to get Forge's device on Archangel just as he flies out the window. As he slowly lowers to the ground, dazed, Forge is confidant he and Beast can now remove the poison capsule, but just then, Crimson and the rest of the Ravens appear, claiming Archangel for themselves, then disappearing in a red mist. The anti-mutant terrorist organization the Right returns in this issue, its soldiers now cyborgs with new armor in favor of the old smiley face suits. Their leader is shown briefly, in shadow, in one panel. Given the involvement of the Right and the prominent glasses, it's probably not a big surprise that this turns out to be an alive-after-all Cameron Hodge, though he his deliberately not named in this issue. 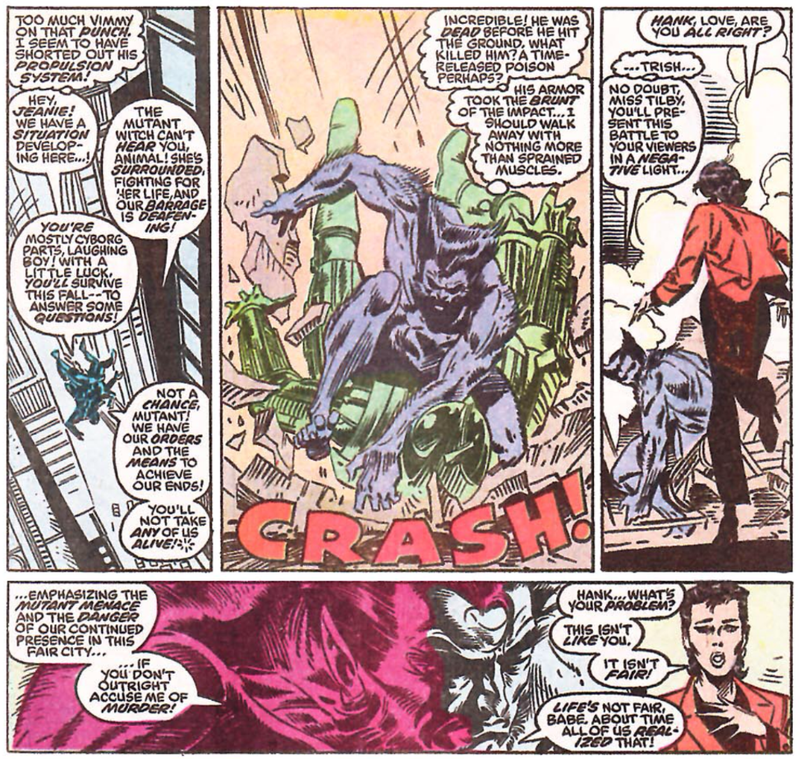 His appearance here sets up his later appearance in "X-Tinction Agenda", in which he plays a significant role and more about his survival (as well as his strange condition in this issue) is revealed. This issue also makes it clear that while Angel's identity of Warren Worthington III was a matter of public record, the fact that Archangel is Warren is not known to the public, a piece of info that comes out in the course of the issue, prompting Trish (who had figured it out pre-"Inferno") to worry about how Hank will react when she reports the story. As promised in X-Men #264, Forge and Banshee guest star in this issue, though their involvement is said to be driven by their having seen X-Factor on TV and thinking they could use their help, as opposed to the whole "we're living in and working out of your skyscraper headquarters now, that's why we're here" status quo established in X-Men #264, another piece of disconnect amongst the creative teams at this time. Future X-Men and superstar artist Andy Kubert pencils this issue, his first interior work on an X-book. 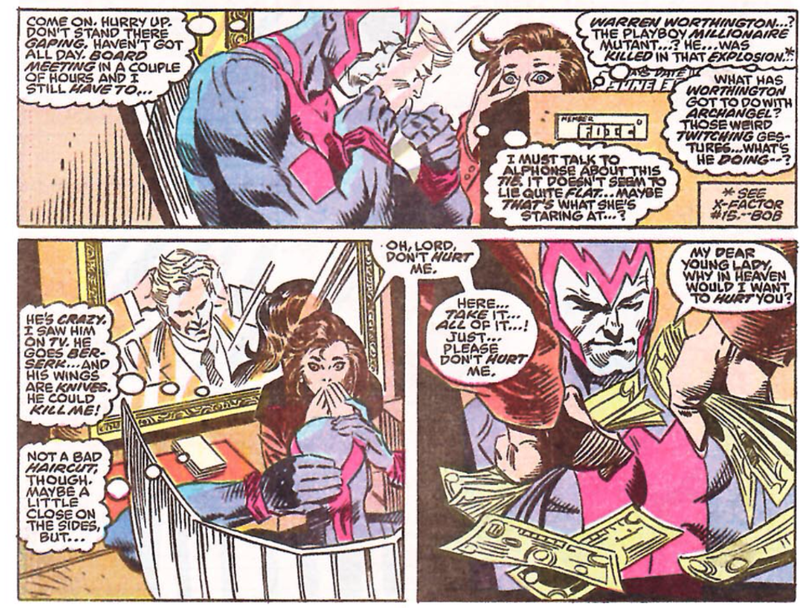 His work is still a little raw, and not helped by Milgrom's inks (then again, no one's work is helped by Milgrom's inks) but his style is still noticeable in it, with its squinty eyes and broad shoulders. This issue establishes that Archangel's contact with Crimson in the previous issue has stoked his memories, leading him to spend the issue believing himself to be the old Warren Worthington III, thus pinning his delusions on more than just Sabretooth's poison from issue #52. Crimson has some kind of magic mirror that shows her who the most powerful Raven is, and I'm pretty much done with all this Raven hoo-hah at this point. Cyclops notes that he never expected to see Banshee in an X-Men uniform, but I think he's leaving off "again", as he saw Banshee in an X-Men uniform many times during the "All New" era. 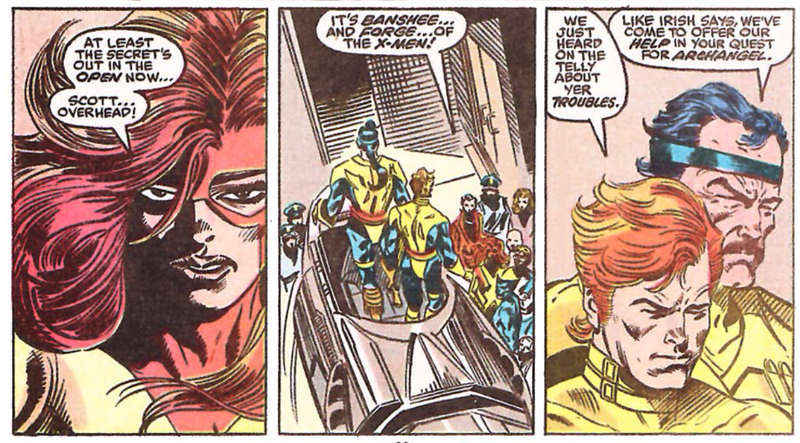 But even then, it would suggest Cyclops was unaware of Banshee getting his powers back, even though he was the one member of X-Factor present when that happened (see above re: creative disconnect). Also, Banshee's X-Men uniform in this issue doesn't have the shoulder capes/wing dealies on it, though they've previously been a part of this specific uniform as well as his previous ones. Forge reveals that Sabretooth most likely poisoned Archangel via a capsule he inserted into his body, another explanation for why Archangel is still hallucinating, and a rare reference to the events of the Meltdown limited series (though I'm not sure how Forge and/or Banshee could know about those events, given that they have yet to make any contact with any member of the X-Men who was present for that story/remembers being told about it). 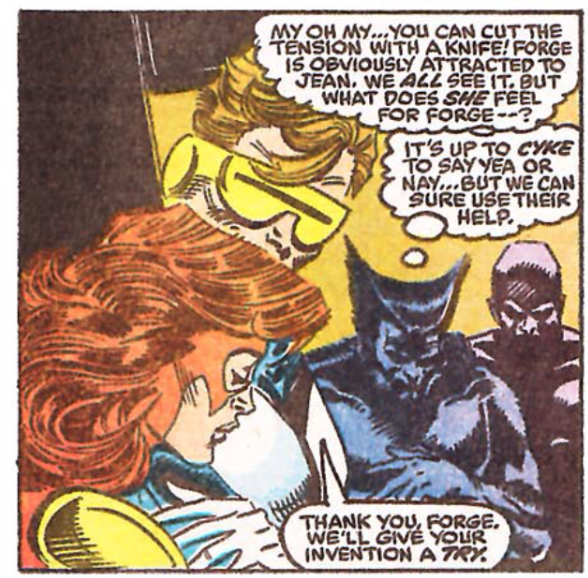 Cyclops is also cool towards Forge as a result of what he did to Storm, something we also saw/will see in their interactions during "Days of Future Present". 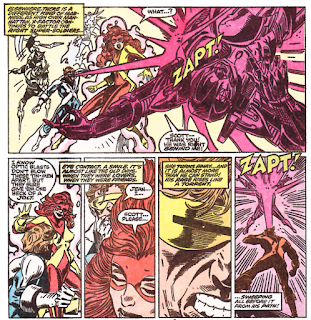 Angry about the lingering rift between him and Jean, Cyclops channels his rage at the Right soldiers. Kubert draws Archangel's wings to suggest that they're at least partially hollow shoot out his feather knives from openings in the tips. Hank is now openly sniping at Trish, still angry over the way she's reporting on Archangel's rampage. 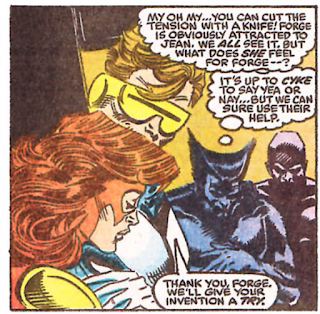 Beast detects what he declares obvious sexual tension between Forge and Jean, the beginning of a brief Forge/Jean/Cyclops romantic triangle that never really gets off the ground. A nice break from the Ravens business, as they mostly slink into the background for this issue in favor of the return of the Right, a villainous organization that at least has a history and thematic connection to the team. Combined with raw but still effective Andy Kubert art, the ongoing presence of supporting players Charlotte Jones and Trish Tilby, and the quirky team-up with Banshee and Forge, this is probably the best issue of the series since X-Factor returned from outer space. That said, this issue also highlights one of the problems with the series at this point in time: with Archangel essentially off on his own since issue #52 and the rest of the team chasing after him since #54, the book is now deep into another extended period (coming quickly after an even longer period) in which the team is scattered and incomplete. Going back to Angel's apparent death in issue #15, the amount of time X-Factor, the team meant to be comprised of the original X-Men, has actually been the team of original X-Men is woefully small; pretty much just "Inferno" and its immediate aftermath, along with issues #50 and #51. Putting aside all other problems with the Ravens as antagonists, it would just be nice to see X-Factor being X-Factor for a while, so watching Archangel get caught up in a group of emo pseudo-vampires is made even less interesting because it's, ultimately, yet another way to keep the rest of the team separated from Archangel even longer. 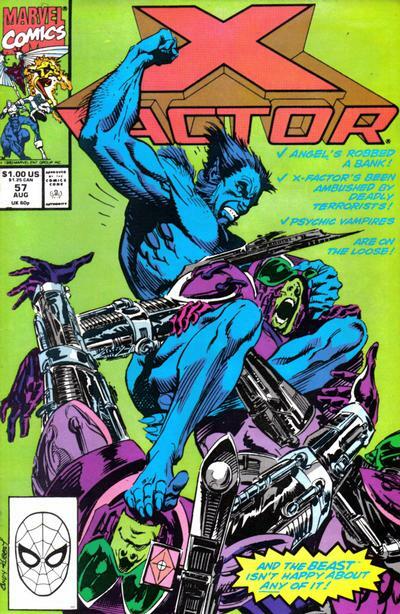 Next week: Uncanny X-Men #266, Excalibur #25 and Wolverine #28. Which makes the public pretty bad at inference. There isn’t even a line of dialogue that goes, “It makes sense! After all, Worthington belonged to X-Factor as The Angel!” Geez. Yeah. I’m used to that kind of thing in sprawling, line-wide crossovers, but this is embarrassing. His stuff looked quite a bit more like his dad’s back then. I first saw his and his brother’s work in 1988’s Doc Savage series at DC, where they traded off pencils and inks, and I can’t help wonder how much of the likeness is inherent versus the result of training at the Kubert School. Um… Nope. She’s just sarcastically doing the Evil Queen schtick, and letting us know via captions that like traditional vampires the Ravens have no reflections. A lousy way to traipse through high society without getting noticed, seems to me. Steven Carr drew them that way in the previous issue. I prefer it. I love the "It's Banshee and Forge... of the X-Men!" bit, and it being said by folks like Cyclops, Jean et al. They've obviously been reading their UNCANNY and acquiesce to this totally being the case now. The X-Men, the superhero team we sometimes cross over with but have no any particular connection to them. @Blam: I can’t help wonder how much of the likeness is inherent versus the result of training at the Kubert School. I've often wondered that too. She’s just sarcastically doing the Evil Queen schtick, and letting us know via captions that like traditional vampires the Ravens have no reflections. Hm. I guess I missed that. But yeah, I've always liked that interpretation of how his wings work. @Teemu: I love the "It's Banshee and Forge... of the X-Men!" bit, and it being said by folks like Cyclops, Jean et al. How do Banshee and Forge know about the assassination attempt upon Havok and Wolverine from the Meltdown Limited Series when the previous chapter of this story arc, Uncanny X-Men #262, has them both still not entirely sure whether the X-Men are alive until Jean confirms it in that issue?